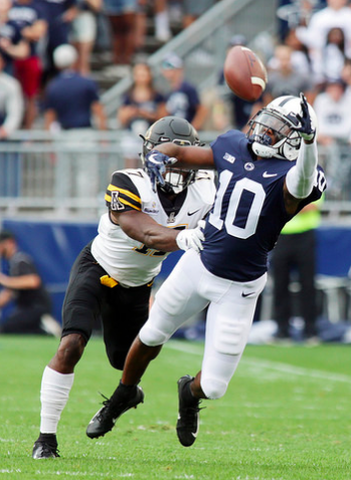 Penn State redshirt junior receiver Brandon Polk probably chuckled to himself as KJ Hamler took a jet sweep and ran down the sideline past defenders and into the end zone on a wet Saturday evening in Pittsburgh. Polk, a speedster, one of the fastest players on Penn State's roster had made his mark years ago with the jet sweep as his calling card. When Polk was on the field, you knew what was probably coming next. But then both the play and Polk were buried in the offense as coaches changed and the Nittany Lions continued to welcome more and more talented receivers to the roster. When Penn State made its run in 2016 and then again in 2017, Polk was a rare fixture in the offense. The first season because of injury, the second because he had fallen behind. Of course, that doesn't mean the pride isn't there. "I'd still say I'm faster than KJ," Polk said with a laugh earlier this week. "It's fun going out there seeing guys use their talent to help the team." Like so many players on Penn State's roster the 2018 season is a welcome sight. There's no denying they all enjoyed the fruits of two exceptionally successful seasons, but now all of the big names are gone, and in turn that means someone else has to step up. Perhaps a stressful thought for fans and coaches, but for players like Polk, an exciting time in their careers. "I still talk to DaeSean (Hamilton) and all them today," Polk said. "They just kind of helped me get through the process, as well as my family. Going in there and not giving up." "My dad always told me: Quitters never win. So it's not something that I kind of want to do. I was never in my mind, like, I don't want to be here any more because this is not going anyway. I just thought for me, the best thing for me is put my head down and keep working and when my opportunity comes, just make sure I take advantage of it." So far Polk has done just that, a key fourth-down reception against Appalachian State kept the Nittany Lions from a season-opening upset. He was wide open, almost too open, but with the calm of a player in his fourth year, he hauled it in. No bobble, no juggle, just a calm cool and collected moment. For once, Polk wasn't fast. "My objective in my head, wasn't,' don't drop the ball.' It was catch the ball first, and then go," Polk said of the play. "So I wasn't thinking negatively, like if I drop this ball, this is what's going to happen. I was just making a play when a ball came to me and I feel like I did everything in my ability to make sure I got it done." And if Polk keeps doing things like that, Hamler can have the jet sweep. 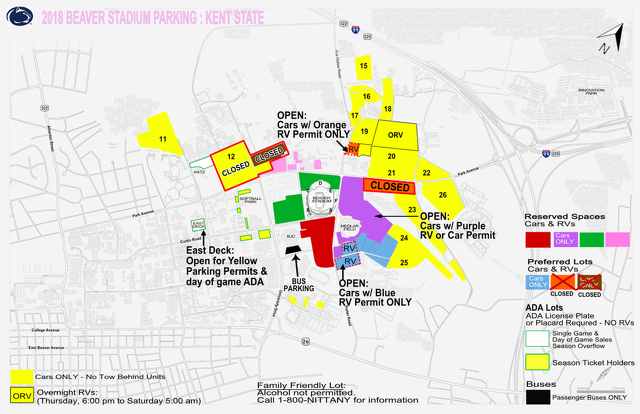 Fans headed to the Penn State-Kent State football game on Saturday at Beaver Stadium will encounter some parking lot closures, thanks to this week's heavy rain. Combined with the saturating rain over the past few days, vehicular traffic could potentially cause significant damage to intramural fields typically used for football parking.